Hi folks. Ma.gnolia is a lot like del.icio.us. It is a bookmarking sharing site. But it’s a little newer and nicer than del.icio.us. Three distinguishing features are that it looks better and it has powerful support for groups and has an easier to comprehend UI. The advantage of these kinds of sites at minimum is that you get humans (your peers) helping you find cool stuff on the web rather than relying solely on your own efforts to find cool stuff that matches your interests and priorities. If you find some people who share some of your interests, sharing bookmarks saves time and increases the value of your internet time. When you join Ma.gnolia, you can join any of the existing groups or create your own. There’s a FileMaker group already that hasn’t gotten a lot of attention thus far but I thought I would tell you about it and encourage people to start sharing FileMaker-related bookmarks in Ma.gnolia’s FileMaker group. By the way, you don’t have to join Ma.gnolia. The FileMaker group is open to the public. If you do register, it consists of selecting a username and password and giving them an email address of some sort. Easy. I like playing with new social software like this and hopefully sharing with fellow FileMaker developers to our mutual benefit. Places like this keep things interesting and afterall we are software developers and like to play with new software don’t we? Update March 23, 2008. Since telling you about the Ma.gnolia FileMaker group, I’ve discovered Diigo which seems to be a more full-featured, firefox-supported bookmarking site. Anyone like that? Let me know if you have a preference or even prefer del.icio.us. One major advantage of del.icio.us is that it is most widely adopted. There are also rumors of a new version of del.icio.us and more social bookmarking features in Google Reader. No matter. But I would love us to collaborate around sharing links pertaining to filemaker. Let me know your thoughts here or via email. This entry was posted in FileMaker Resources on March 1, 2008 by janet. I purchased BaseElements from Goya in mid December and it is a must have tool from my perspective as a FileMaker developer. I need all the help I can get to document my solutions, check them for errors and find my way around my solution when I’m building new features or debugging something that’s not working the way I want. BaseElements takes the XML in the DDR and puts it into nice little FileMaker records where we can see exactly what is going on and get to the heart of the matter in a hurry. I’m enjoying having this tool very much but I found it even more valuable after making a discovery. The solution is pretty open but where it is really wide-open is when you create new layouts. 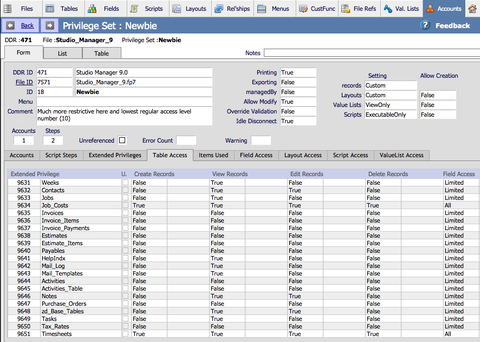 I was trying to get all the table and field access details of the 16 privilegesets in Studio Manager into records so I could print them out as documentation and use them as a reference without having to go into Manage Accounts & Privileges. It wasn’t obvious how to do this because all I could see was a privilegeset record with some tabs, one of which showed each table in a portal with things like whether you could create, edit or delete records in that table given the current privilegeset. I wanted all the custom field access. What fields could they not see? That seemed to require getting down to a lower level of granularity but there was no tab for that. I happened to try creating a new layout and voilá all the related tables within the PrivilegeSets table were there for my choosing. End of problem. You can export data too. I don’t really need to export, but creating a simple custom report layout will give me what I need. My next experiment will be to try out the compare file capability introduced in version 1.6 that lets you compare one version of a solution with another. I already purchased and wrote about FMdiff and recommend it to the skies for those who need a near instantaneous way of comparing two filemaker files. This entry was posted in FileMaker 9, FileMaker Resources, FileMaker Utilities on March 1, 2008 by janet.